Collaboration with all the other Oriental communities present in the Basilica and with the civil authorities for the restoration of the Tomb of the Risen Christ. Partial restructuring of the convent. Upkeep and restoration of the convent and site (covering of the Grotto, PA system, hot water installation, cleaning of the mosaics). A new organ for the Basilica. In course of realisation: tunnel for pedestrian communication between the area of the Basilica and the parking lot on the side of the Kidron Valley. In course of realisation: a centre for the service of pilgrims. Realisation of a new kitchen for the convent. Restructuring and requalification of the existing premises. Remaking: of the waterproofing system and pavimentation of the roof of the right aisle of the parish Church; and of part of the floor tiles of the parish hall. Realisation: of a new ecological area of the convent (Phaser II); of the new offices of the Associazione di Terra Santa, of a new covering of the old dovecote, of a storehouse in the mezzanine of the new laundry, and of the place of the workshop-carpentry. Infirmary: Changing of the beds with hospital beds with electric handling equipment donated by the hospital of Bergamo; remaking of the water system and of some bathrooms. Restructuring of the premises of the seminary, of new office, and of the premises of the archives in the ex-office of the Secretary. Cleaning and consolidation of the facades of some courtyards. Projection to regain an area (ca. 1600m2) to be destined to various uses, including new offices, library, refreshment area, new spaces for the Magnificat Institute, parking lots and Auditorium underground. Realisation of a modern museum centre for the valorisation of the artistic, archaeological and cultural Franciscan heritage. Within an area of circa 2500m2 are included: Museum Via Dolorosa, Flagellation (works concluded); Archaeological Museum, Flagallation (works in progress), Historical Museum at Saint Saviour (works in progress). Termination of the restructuring of the bathrooms on the second floor for the welcoming of pilgrims at reduced prices. In the course of projection and realisation are the works on the floor destined to be the convent of the Elisabethine Sisters. Project for the realisation of rooms for volunteers and residents, with bathrooms, kitchen and dining hall. In course of realisation are the works of complete restructuring of the centre in which a new refreshment area for pilgrims will be installed, together with a multimedial didactic hall dedicated particularly to the Holy Sepulchre. Restoration and developing of the Byzantine and Medieval remains of the convent of Bethany through: the recovery of degraded areas; the formation and employment of 10 young Palestinians in the restoration; sustaining of the business activities of the local femminine association; didactic project with primary schools for the knowledge of the local religious and archaeological sites. Realisation of new parish halls and new bathrooms for pilgrims. In course: works of the remaking of the roof of the church of Saint John; restructuring of the premises of the seminary and convent of Saint John. Concluded: consolidation of the ancient small convent of Saint John transformed in a new convent for the “Sisters of Catechism”; hall/dining hall for pilgrims and the terraces in the garden. In phase of programming the works of the restoration of the church, which shows static problems. Restructuring of the facades of the courtyard of the sanctuary of the Visitation. Concluded the restructuring of the chapel at the Tomb of Saint Elizabeth. Reconstruction of a hermitage, as a result of the forest fires of 2015. Collaboration with the other ecclesial comunities present and the ANP to the restoration of the Basilica of the Nativity. Revision of the sanitary water system and waterproofing of the roof of the convent. Concluded the restructuring of the roofs and the realisation of the maintenance of the lattices. Programming of some interventions aimed at improving and renewing furniture in the kindergarten. Access for disabled: construction of a lift and acquisition of two automatic slides. Restructuring: sacristy of the lower basilica and of the foundations of the sanctuary. Installation of a multimedia centre for television transmissions of the Christian Media Centre and Canção Nova. Concluded: restoration of the mosaics of the byzantine church; the works of adjustment of the system of videocameras to control the site. Realisation: alternative access to the sacristy and recovery of the underlying premises; guest lodgings (ca 10 places). Phase II soon to be realised: the accessibility of visitors to the archaeological site through routes and wooden passageways across the archaeological zone. Remaking of the pavimentation of the parking lot for coaches. Complete replacement of the air-conditioning system. Conclusion of the internal maintenance works (pastering, electrical system and air-conditioning). To be realised shortly: works of maintenance of the facades. In course: the realisation of a storage area in the premises underneath the sacristy. Concluded the realisation of a new parking lot adjacent to the principal entrance – Phase I. In phase of programming: the internal parking lot of the monastery (600m2), of the principal road linking the external and internal parking lots, and bathrooms for pilgrims – Phases II and III. Concluded: the project of the new covering for the roof of the basilica of the Memorial of Moses; an exhibition route for the mosaics discovered during the excavations, works of restoration and conservation of the mosaics and of the external walls; restructuring of the bathrooms for pilgrims; archaeological storeroom. The whole project has been inaugurated on 15 October 2016.
Financing: 390 scholarships for university studies for a period of 4 years, distributed in the various Universities (Bethlehem, Hebrew University, Bir Zeit, Amman); 178 subsidies for students in difficulty. Acquisition of spare parts, machines for production, auxiliary equipment for the safety of the activity of 10 small artisan activities. Concluded the realisation of laboratories for ceramics in the premises of the Saint Francis Millennium Centre adjacent to the laboratories of wood, mother of pearl and ceramics which are ready and functioning. In phase of realisation: a centre for the selling of products of local artisanship (wood, mother of pearl and ceramics) produced in Bethlehem, a space of circa 250m2 within the Old City of Jerusalem. In continuation: the projects to sustain a parish family counselling centre; the project aimed at more than 20 boys (aged 6-12) coming from families in difficulty; medical assistance for families in serious economical difficulties; restructuring of houses of the most needy families. Concluded the realisation of a building that will guarantee around 460m2 for the activities of the parish. Concluded the realisation of a new wing of the Terra Sancta School for students of the secondary cycle..
Terra Sancta School: Concluded the realisation of new wings for the secondary cycle. Terra Santa School for girls: Concluded restructuring and recovery of premises underneath square. Terra Sancta School for boys: Concluded part of the restructuring (renewal of the internal spaces with the reallocation of some of them, the realisation of new spaces for kindergarten, remaking of the systems). Programming of two basement levels underneath basket-ball field, to serve as a sports centre. In course of realisation: the works for the construction of a new school (structural works concluded). The whole complex will also include a parish centre and a covered parking lot covering an area of 5000m2. Extraordinary maintenance of the whole complex, which is now being run by the Franciscans. Old City. Continuation of the works of restructuring of the houses of the Old City with the aim of improving the conditions of life of the residents: complete restructuring of 7 houses (4 in 2015, 3 in 2016); partial restructuring of 6 houses (2 in 2015 and 4 in 2016); restructuring of the external shells of 5 buildings. Dar al Consul renovation project. In course the restructuring of the residential complex in the Old City, with 41 apartments and a ground floor which is currently not in use. The area of the project covers circa 2500m2. Class A restructuring with Major interventions of 14 buildings (in course of which 5 completed). Class B restructuring with Medium interventions of 16 buildings (in course of which 8 completed). Class C restructuring with Minor interventions of 11 buildings (in course of which 5 completed). Restructuring of external shells of 6 buildings in course (of which 2 completed). Dar el Kbire: Programming of the extension of the edifice of 300-400m2 and intervention on 19 deteriorated existing houses (6 are ready). The total area interested in the project is ca. 2500m2. Tumian Palace: In programming the extension of the building with the realisation of 3 extra floors and 800m2 for residential use. Abu Geries: In phase of programming the intervention of the enlargement of the edifice with the realisation of 750m2 destined to become offices, restaurants and shops. Saint James housing project of Beit Hanina: this is a complex of 6 buildings with a total of 42 apartments divided on 3 levels. After having gained permession to build an extra two floors in each of the edifices, for a total of 24 apartments. In course of programming the executive projection for the upper floors. Bethfage (Mount of Olives): programming of new apartments, an extension of circa 750m2 of the residential complex consisting of 10 houses; realisation of a boundary wall to protect the entire property. Pisgat Zeev housing project: Programming of a new residential complex with 70-80 dwelling units and 300m2 for commercial use. The Franciscan Neighbourhood: Acquired permits to build 124 apartments destined for the Christian families of the parish. The total area of the apartments will cover circa 10.000m2. Housing Project in Nazareth: Project for the realisation of a residential complex, where besides the Chapel and some premises for social use, we plan to build 80 apartments to be destined for young families. Studium Biblicum Franciscanum. Each year the Custody of the Holy Land sustains economically the Faculty of Biblical Sciences and Archaeology of the Studium Biblicum Franciscanum of Jerusalem. It offers circa 30 scholarships for students coming from various dioceses, covering the entire period of their studies. Christian Media Centre. The Custody has given a new name to the Franciscan Media Centre, and from December 2014 it is called Christian Media Centre. The services offered include: Website, completely renewed, simplified in its use and now mobile friendly; Terra Sancta News, a weekly news bullettin which presents faith, history, current events in the Holy Land; transmitted by ca. 35 broadcasters in the world in 6 languages; documentaries on social and religious themes in various languages; direct transmission of liturgical celebrations and events. Magnificat Institute of Music. In a few years of activity the Magnificat has become a school of music, in grade of preparing various students coming from diverse cultures (Christians, Jews and Muslims). The Magnificat promotes activities of research and cultural manifestations on the local and international level. 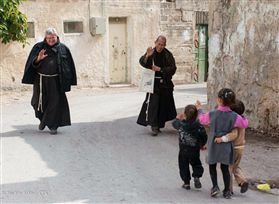 In Syria, Jordan and Lebanon we have intensified the continued the aid to the Syrian and Iraqi populations, both Christians and non-Christians, who live in a situation of extreme need, through the presence of the Friars of the Custody of the Holy Land with the financial help and collaboration of the Associazione di Terra Sancta. We have placed some halls of the Seminary adjacent to the Terra Sancta College for the use of a group of women refugees from Iraq. Aid to some families in the refugee camps. 35 families are being welcomed and sustained on a temporary basis at Deir Mimas and Harissa, while waiting to obtain visas in order to emigrate. When these families leave Lebanon they will be substituted by new families. 50 Iraqi and Syrian children and young people are helped to be able to go to school. In the parishes of the Custody in Aleppo, Damascus, Knayeh, Yakoubieh and Latakieh we have continued to strengthen the activities in the emergency centres. The aid is principally directed to the emergency centre of Aleppo in the parish of Saint Francis, where the needs of the Christian and non-Christian population have been greatest. In overall terms the aid to the population has been realised thus: 120 houses repaired; 85 families helped every month to pay their rent; 1.650 families have recieved every month food and other items of first necessity; 540 families each month have received water in their houses; 440 persons each month have been helped to buy items of first necessity 840 families every month have been given economical aid to be able to have electricity; 480 students of the primary and secondary school have been helped to be able to go to school and pay their school fees. We have supported the hospital Al Rajaa of Aleppo, which can hold 60 beds and which belongs to the Custody of the Holy Land, through: rehabilitation of the second floor (12 rooms with 24 beds); providing necessary medicinal equipment; sustaining the medical care and hospital expenses for 90 patients. Aid through food supplies and first assistance to refugees who pass through the centre of temporary welcome of Rhodes and Kos. Wages of circa 1300 employees in 80 shrines, 15 schools, 25 parishes, 4 Case Nove for pilgrims and various other activities.